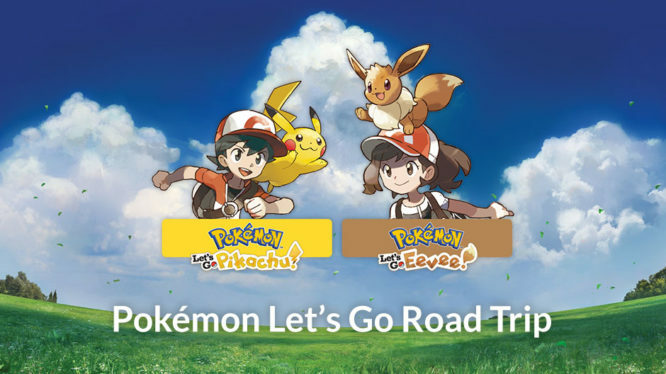 Pokémon kick off U.S. road trip to demo Let’s Go, Pikachu! and Let’s Go, Eevee! Game demos, photo opportunities and special giveaways! Nintendo and The Pokémon Company have kicked off a new cross-country road trip in the USA, giving gamers a special opportunity to try Pokémon: Let’s Go Pikachu! and Pokémon: Let’s Go Eevee! ahead of the games’ launch on November 16th, 2018. 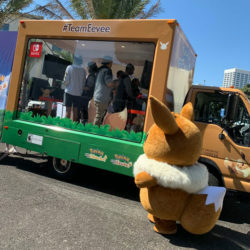 The tour kicked off in Los Angeles on September 29th, where multi-platinum recording artist Jordin Sparks joined hundreds of fans eager to check out the new games and hang out with Pikachu and Eevee in person. Fans in the United States can visit the pop-up events over the next couple of months and can expect demos (including the Pokéball Plus), fun photo opportunities and special giveaways. Each stop will also feature a unique Pokémon Snapchat filter and fans of Pokémon GO may even notice increased sightings of Pikachu and Eevee at the events. The Pokémon: Let’s Go, Road Trip! continues on October 6th as Pikachu and Eevee come to San Francisco. Following this, the tour will visit six more cities across the U.S. before finishing with a midnight launch event at Nintendo NY on November, 15th. To celebrate the introduction of Pokémon in America, the tour will stop off at Topeka, Kansas where Pokémon Red and Blue launched for the Game Boy almost 20 years ago before. San Francisco, California Oct. 6, 9 a.m. – 6 p.m.
Seattle, Washington Oct. 13, 9 a.m. – 6 p.m.
Dallas, Texas Oct. 20, 9 a.m. – 6 p.m.
Topeka, Kansas Oct. 27, 9 a.m. – 6 p.m.
Chicago, Illinois Nov. 3, 9 a.m. – 6 p.m.
Boston, Massachusetts Nov. 10, 9 a.m. – 6 p.m.
For specific time and location information check out the Nintendo Switch Events website.